When Marlborough became incorporated as a town in 1660, many land grants were awarded in an area then known as "The Meadows." Fort Meadow was one of the many meadows in this area, supposedly named for a small fort that was located nearby in the very early years of the settlement. Fort Meadow appears to have remained as meadowland for a century and a half, as an 1803 map still shows that area as an open meadow with a brook (later named Fort Meadow Brook) running through it. However, this map also shows the location of a mill on the brook that would soon change the nature of Fort Meadow dramatically. In the late 18th century, Calvin Maynard constructed a gristmill on Fort Meadow Brook near the current town border with Hudson. The gristmill was soon converted to a sawmill and its operation was eventually passed on to Isaac Maynard, whose death around 1820 left his young son Amory in charge. The construction of the mill and a dam on the brook began to create a small pond, flooding Fort Meadow. Around the year 1847, the City of Boston purchased the rights to this small lake and the surrounding land from Amory Maynard for $150,000, the largest sum that had ever been paid by the City of Boston for water rights at that time. By 1848 the pond had already become a large lake, but in 1858 the City of Boston decided that it no longer required the water from this site and sold it back to Maynard for $8,000. By the end of the 19th century the lake was no longer a source of drinking water. Much of the lake's south shore was developed as a lakeshore cottage community in the 1930's and 1940's, and new year-round homes were also built on Lakeshore Drive in Hudson at that time. Now the shores are dotted with houses. Still known as the Fort Meadow Reservoir despite its disuse in that function, the lake currently occupies about 308 acres of land in both Marlborough and Hudson, and both towns have public beaches on its shores. The 13-acre public waterfront in Marlborough was purchased by the city in 1953 from Amory Maynard's successor, the American Woolen Company, and was officially named the World War II Memorial Beach, although now it is just called "Memorial Beach." 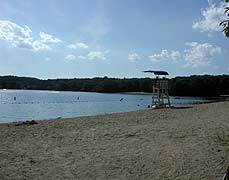 Today the lake is a popular destination for boating, swimming and other recreation. This information was taken from material compiled by John Buczek of Marlborough in his piece "The Lake that Never Was--Fort Meadow." He has displayed his work on his website, which provides some further information and pictures. Researched and written for OAR by Joanna Solins.